As Spring draws closer and the weather gets a bit warmer we can start to shed our layers. I can't wait to say goodbye to heavy coats and get into some light weight jackets. Blazers are a good in-between jacket for Spring into Summer, even on the weekends. 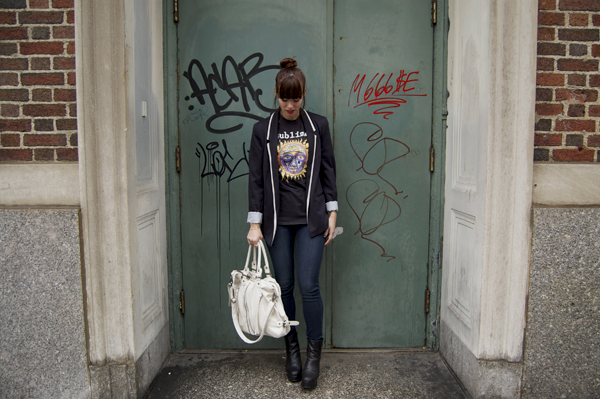 You can have fun with a blazer by dressing it down with a pair of your favorite skinny jeans and a rock shirt. Or you can dress it up with a dress and cute accessories. Most weekends you can find me in my favorite pair of jeans and a t-shirt. I love pairing of a blazer and band t-shirt it's just a great juxtaposition. It also just gives a usual weekend look a chicer statement. Whether you are hanging out in the Lower Eastside or grabbing beers at your local bar this look will make you feel comfortable and chic. Give it a overall grunge effect by pairing your look with your favorite chunky boots. Like this look? Repin it! A jersey dress is the perfect little weekend dress, it's easy and a no-fuss. The jersey dress is something that you can wear to brunch with your friends or out on a casual date. Pairing it with a blazer gives it a polished look, but this is the weekend so have fun with accessories! Go bold with a bright neon shoe and some simple cute accessories. What do you think of these weekend looks? What do you wear on the weekends? 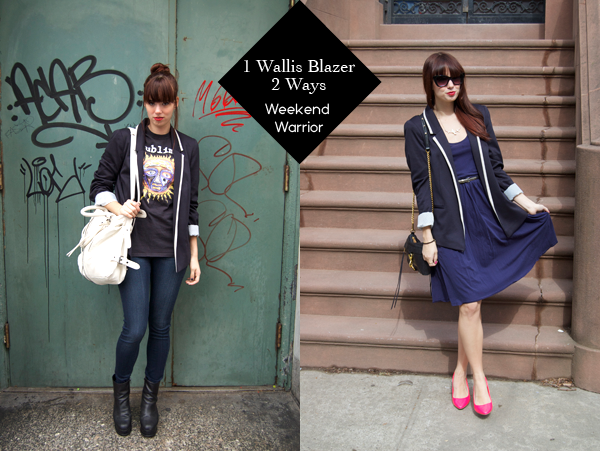 That is such a great blazer - I love the ways you styled it! both of those looks are amazing! Oh, amazings outfits! You are perfect!!! Awesome blazer, but my fav is the first look! Lovely!